"Your horse is a mirror to your soul. You know, sometimes I just don't know where I'm headed. I don't understand why I got a horse to begin with when I have a baby, a career, a husband. I have an incredibly full and happy life with little wiggle room. And then, I see something that just resonates, and it all clicks. I've read a few of Buck Brannaman's books, and liked them. Then, on a whim the other day, I decided to buy Buck's groundwork DVD off of Amazon. Tonight I watched it, and it's like all these holes in my horsemanship training became SO very apparent. I am much more of a "rider" than a "horse person". Watching this DVD made me realize all of the gaps in Finn's training, and all of the things we need to work on prior to riding. I'm viewing this whole laminitis episode as basically a fresh start (think positive! ), and literally as a way to start over. I got Finn, and basically thought, here's my next great event horse! And never really thought about all the gaps in his training, and creating a relationship between us. Finn is tense, stressed, and unconfident 100% of the time. And, I do nothing to help him feel better and more confident. Buck stresses giving to pressure. 100% of the time I am struggling to bridle my horse with his head in the air. It is a constant battle. And it shouldn't be. I want a horse that enjoys his job and is a willing partner. Finn is so far from that. I want a horse that trusts me and thinks of me as the leader. Finn does not. I think I make Finn tense and stressed, because 100% of the time I am tense, stressed, and in a rush. I want a horse that I can say, let's go on a trail ride today, when really all I'm thinking is Finn's going to be nervous/bolt/buck/refuse. As soon as Finn is healthy we are going back to groundwork 101. Hug!! You guys will figure it out and yay that you found some tools to help ya!! If his quote is true, I feel pretty good about my soul. Riding and training is a relationship and like any relationship it takes work on both parts. You'll figure it out and never question why horses are in your life. 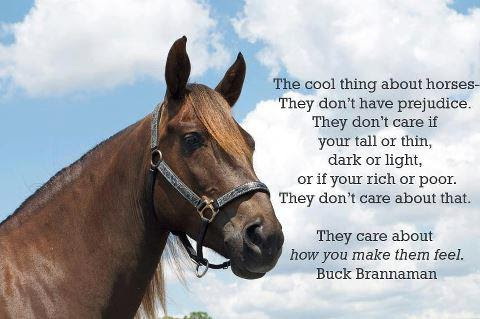 That's my favorite Buck Brannaman quote. It's so true!